This Incremental Rotary Encoder provides 16 pulses per revolution via 2-bit quadrature outputs. 3-pin SIP header provides easy breadboard connection. This encoder rotates continuously through 360 degrees and provides detent to hold position. 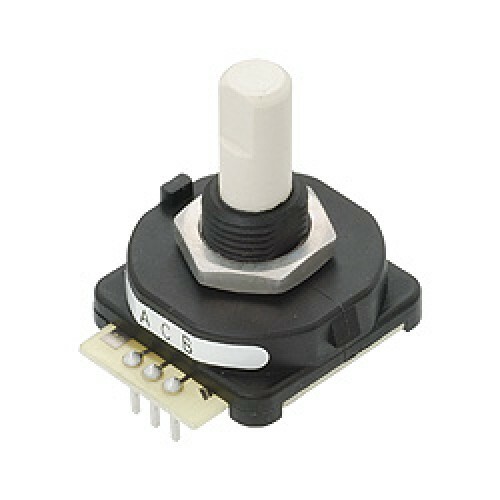 Used with a push button this encoder could provide a complete menu / input system for your microcontroller. The Sound Impact Sensor detects sound from up to 3 meters away, lending noise-activation possibiliti.. This is a cost-effective and highly functional hall-effect sensor. Very easy to interface with all m.. It is possible for more than one position to make contact at a time, such as pressed+right, left+dow..
2-Axis Joystick can be used to add analog input to your next project. The 2-Axis Joystick contains t.. The Mouse Sensor is a module in kit form which, when assembled, provides the tracking functions of a.. The Optical Finger Navigation (OFN) Module can add a unique human interface component to your micron.. The Smart Card Reader provides a low-cost solution for reading and writing data to contact memory-ba..
Add a fun human interface component to your projects with the Trackball Module. Similar t..